The Amsterdam Sculpture Route is an open air exhibition of monumental sculptures in public areas just south of the centre of Amsterdam. 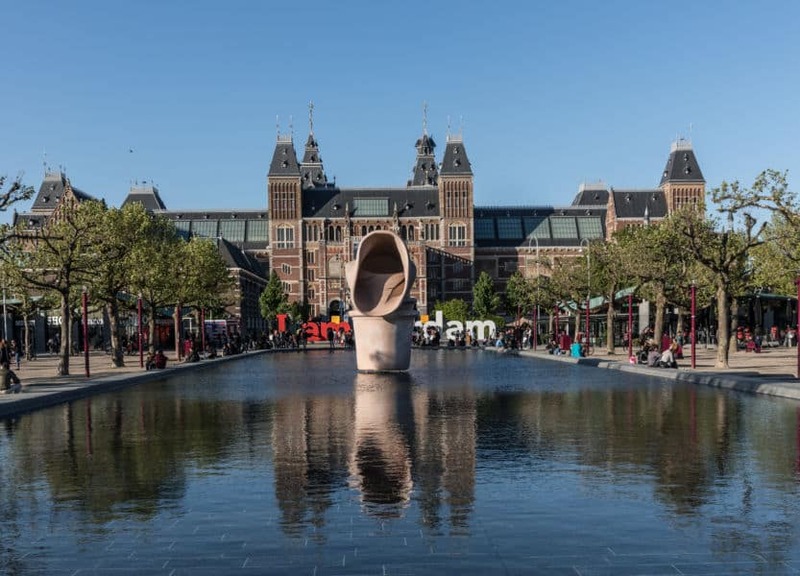 The 6th the International Sculpture Route Amsterdam ARTZUID takes place in the summer 2019. Amsterdam Sculpture Route is free to visit. The Amsterdam Sculpture Route stretches 2,5 kilometers along the Apollolaan, Minervalaan and the Zuidas. ARTZUID 2017 followed the theme year Mondrian to Dutch Design – 100 Years of De Stijl ands shows the influence of Dutch art movement De Stijl (The Style) on post war Dutch sculpture. Curator was Dutch art historian Rudi Fuchs, also former director of the Amsterdam museum of modern art, the Stedelijk Museum. Participating Dutch artists: bAd Dekkers; Joost Baljeu; Jan Maaskant; Gust Romijn; Carel Visser; André Volten; Theo Niermeijer; Shinkichi Tajiri; Cornelius Rogge; Klaas Gubbels; Auke de Vries; Lon Pennock; Piet Killaars; Ewerdt Hilgemann; Jeroen Henneman; Atelier van Lieshout; Sjoerd Buisman; Piet Tuytel; Ruud Kuijer; Hans van de Bovenkamp; Leo Vroegindeweij; Esther Tielemans; Krijn de Koning; Michael Jacklin; Saskia Noor van Imhoff; David Jablonowski. Participating international artists: Cristóbal Gabarrón; Ryszard Winiarski; Arne Quinze; Miquel Barceló; Kurt Ryslavy. The Amsterdam Sculpture Route ARTZUID 2017 is located in a residential area in the South side of Amsterdam. This is a rather rich neighbourhood with many villas. The area was constructed in the architectural style of Amsterdam School (1915 – 1930), with lots of detail, use of many different materials, and sculptures. The sculptures are easy to visit by foot of bike. Take tram 2, 5 or 24 or from the train station Amsterdam Zuid. From Vondelpark it’s a 15 minute walk. From the visitors pavilion at Minervalaan 1, you can buy the catalogue, route map, souvenirs and snacks. There is also an app available. Every day from the visitors pavilion there are guided tours. The walk along the sculptures is guided by an art historian and starts with a short introduction to the 100-year-old De Stijl movement. The impact of this movement on the work of the participating artists will be discussed. The walk lasts 1,5 hours and departs from the ARTZUID pavilion on Minervalaan 1 in Amsterdam. More about these guided tours on the website of ARTZUID. In 2009 and in 2011, following the opening by Queen Beatrix, ArtZuid received a total of 350,000 visitors. In 2011 the Foundation received the Europa Nostra Award from the EU, and in 2012 The Best in Heritage Award. The 3rd edition in 2013 drew 380,000 visitors from home and abroad. The Amsterdam Sculpture Route ranks number 10 on the list of free public events in the Netherlands (Research Bureau Respons, 2013). For further information, or to book tours or order the catalogue, visit www.artzuid.nl.